We were fundraising again at the Defford Air Day in June. Thanks to the kindness of the event organizers, once again Wings Like Eagles was featured at this year’s Air Day – our fourth. We thank them for their kind help with our fundraising. This has been hugely helpful for us and most years we have seen our Trustee Clive Langmead flying to help our fundraising and show what we do to the enthusiasts who come. 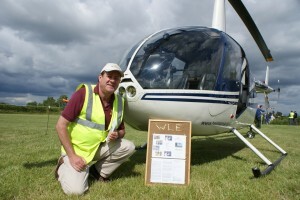 Normally Clive takes an Robinson R-44 Raven 2 to the predominately fixed wing event run from a field of a farm near Malvern in Worcestershire. The Robinson R-44 is a popular type of helicopter in Africa. It is economical and seats 4. However, our experience in our surveys of Mozambique shows that a turbine helicopter is better for disaster response. Not least because the fuel is much easier to obtain. Our affiliate used a Bell 206 Jet Ranger for the 2013 flood response. No one pays for the flights, but there are collection buckets and those who attend are very generous. We thank them all for funds that help us respond more rapidly to disasters in Southern Africa. If you want to join them inn supporting Wings Like Eagles, have a look at the ways to give to us. Sadly Clive Langmead could not fly for us this year, (this is a picture from a previous year as he was busy coordinating events this year), but thousands enjoyed the day, helping our fundraising for disasters in southern Africa. PS if you read the links, we do more than look at helicopters! Have a great day – we think they all did!